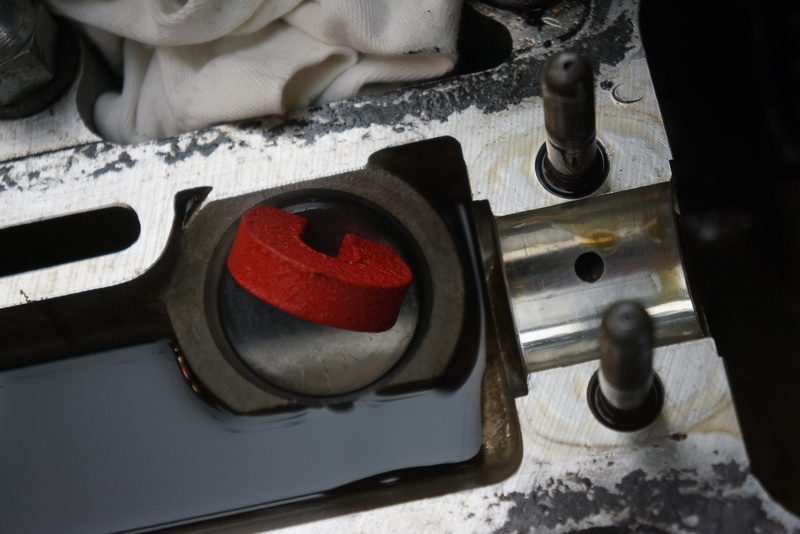 The following weekend, all the old shims came out, and the new shims went in, again following the “one cylinder at a time” rule I established so as not to cross-install the followers which must remain with their original cylinders. When reinstalling the cams, I could not get the timing marks between the cams and front bearing caps to line up. It made me nervous enough that I removed and reinstalled the cams a second time (remember that the timing chain remained attached to the sprockets). I finally convinced myself that once I released the bolt holding back the spring tension in the timing chain tensioner, all would return to sync, and that is exactly what happened. With the tensioner pressing against the chain, I rotated the crank and cams through two complete revolutions, and then tightened the bolt in the spring tensioner. The marks were still aligned, thankfully. 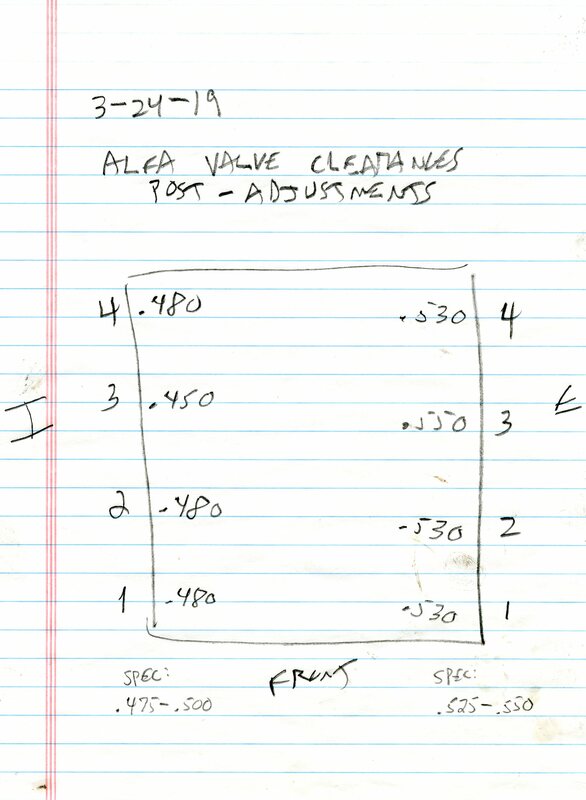 I double-checked and wrote down all the new valve clearances, and all seemed good (but read on). 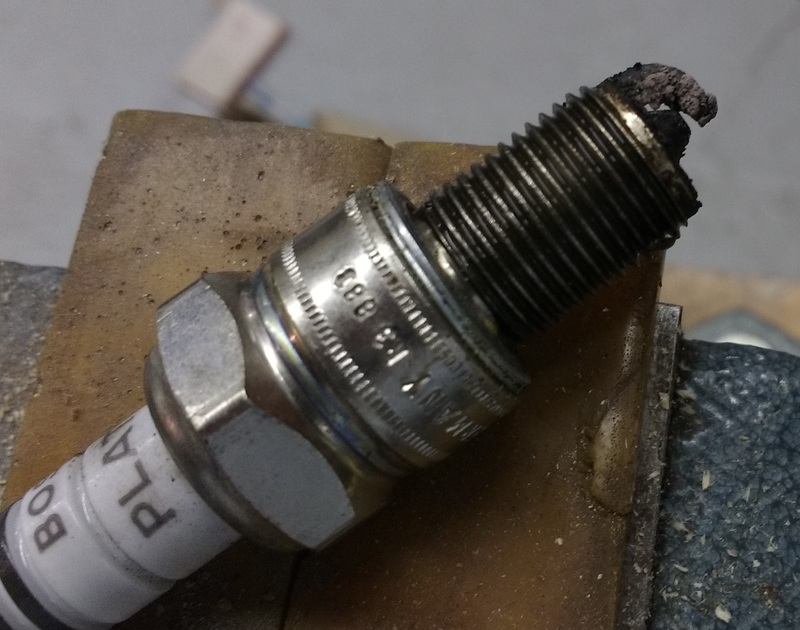 Since I had the spark plugs out, a new set of NGK B7ES plugs, which are in stock at my local Advance Auto Parts store, went in. With plug wires, intake plenum, and air filter hose back in place, it was time to attempt to start this baby, remembering that the engine had not been run since the car went to sleep the previous autumn. The engine started on the second try, however, there was an unhealthy miss at idle. I shut it down, and made plans for a complete tune-up, which was next on the Alfa’s to-do list anyway. Postscript: I jotted down all the “new” valve clearances, and really didn’t give them a second glance, undoubtedly presuming that everything was done correctly. 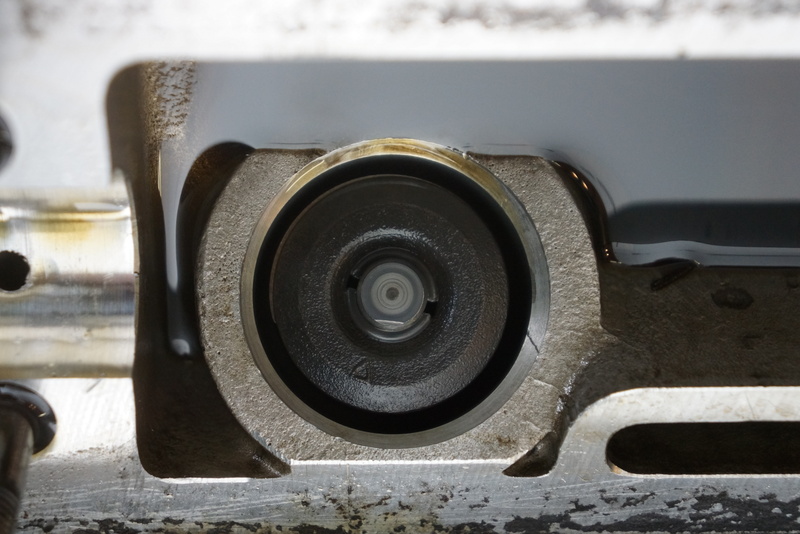 Today, while composing this blog post, I noticed that my spec for intake valve #3, .450mm, was unchanged from its original measurement, yet I have no doubt that the 2.15mm shim which had been in there was replaced with a 2.10mm shim, which means that the new measurement should have been .500mm. 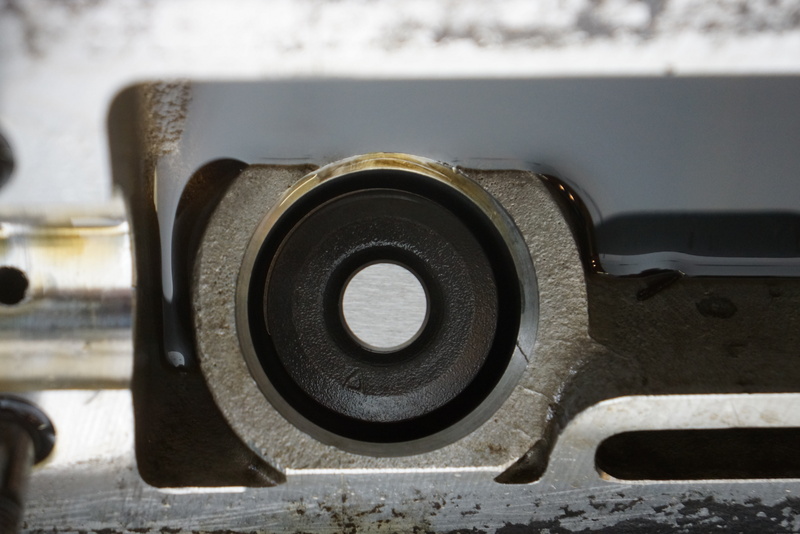 For now, I’m leaving this alone for several reasons: valve #3 was the closest to spec of all the intake valves during the original check; testing the thicknesses of the new shims revealed that how tightly I cranked on my micrometer made a difference in the measurement (including the effect of residual oil on the shim); and I’m not yanking that cam again for 0.05mm! All photographs and video recordings copyright © 2019 Richard A. Reina. Photos may not be copied or reproduced without express written permission. A tune-up? Who performs “tune-ups” anymore? Modern cars have spoiled us with their extended service intervals. My 2014 VW Jetta calls for an oil and filter change every 10,000 miles, and spark plug and air filter replacement every 60,000 miles. That’s about it. 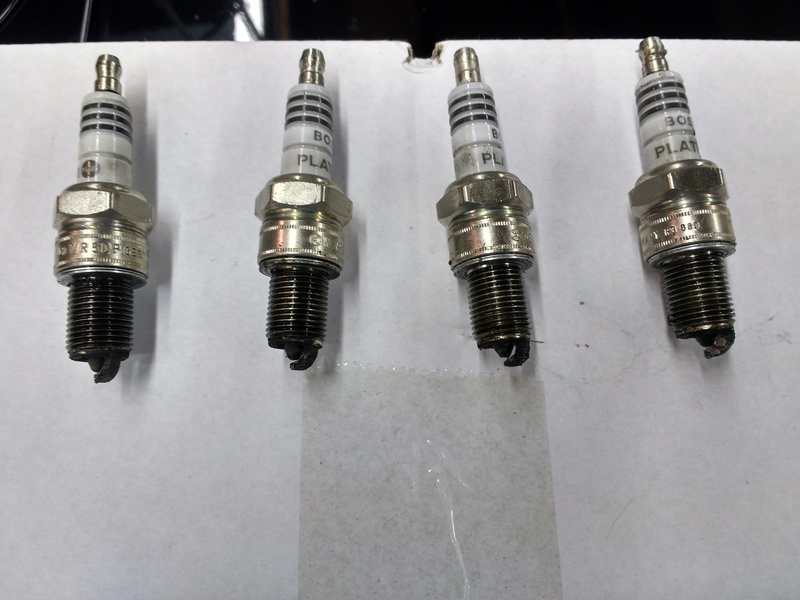 There are other new vehicles for which the manufacturer recommends spark plugs every 100,000 miles. You might forget they were in there if you wait that long. It’s different, of course, with an older car. 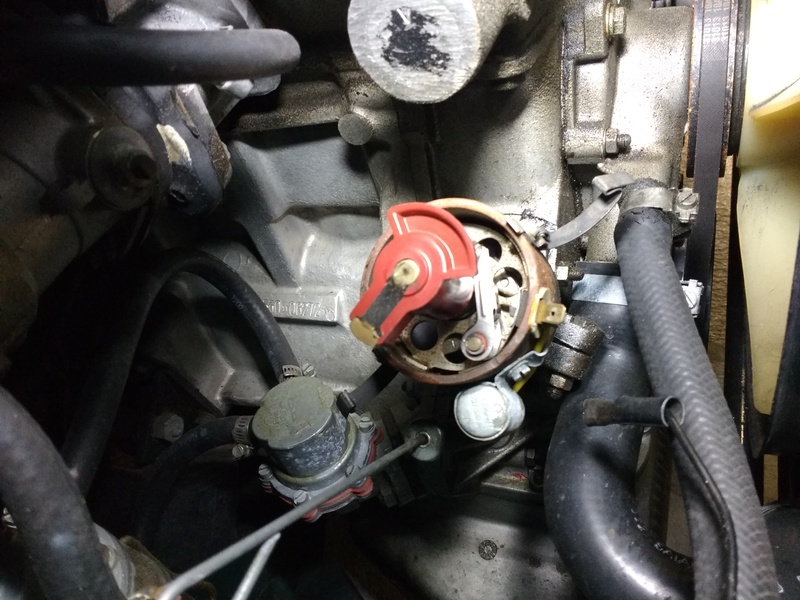 The ’67 Alfa Romeo GT 1300 Junior taking residence in my garage still uses an ignition distributor with a cap, rotor, points, and condenser (ask any person under 30, even an auto buff, what are points and condenser, but be prepared to ‘splain). 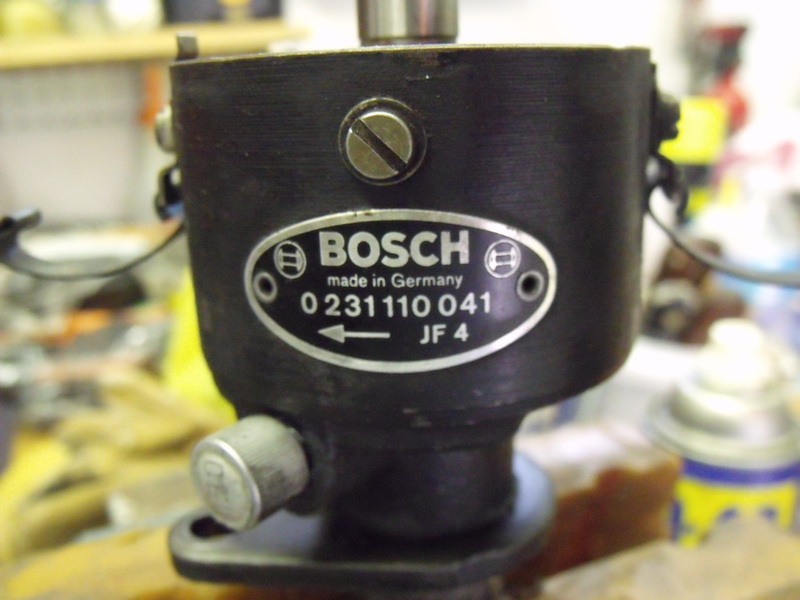 GT 1300 Junior used Bosch electrics. Other Alfas used Marelli. When I obtained the Alfa in March of 2013, with 54k on the clock, I did what I normally do with any used car that’s new to me – I attended to all the normal maintenance items as a proactive measure, no matter how meticulous the previous owner may have been. In my case, the Alfa’s 1.3L engine got new plugs, wires, cap, rotor, points, and condenser. There was peace of mind knowing the tune was good for a while. Right now, the car barely has 62,000 miles on it, so it’s only been eight thousand miles, but it’s been three and a half years. 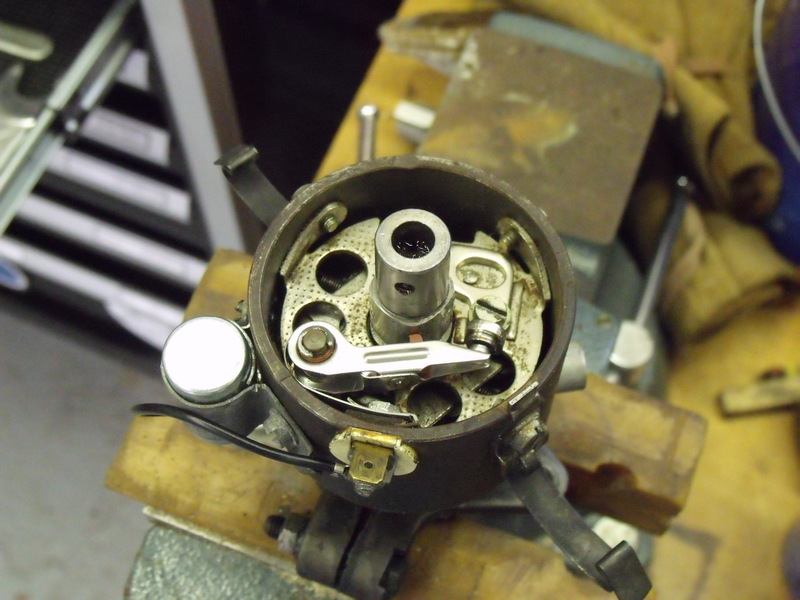 Earlier this year, I ordered a full complement of tune-up items, just to have them on hand. My plan was to revisit the tune at the 10,000 interval, or at 64,000 miles. For some reason, last weekend, I decided to pull the plugs. First of all, I can’t think of an engine on which it’s easier to change the four spark plugs. 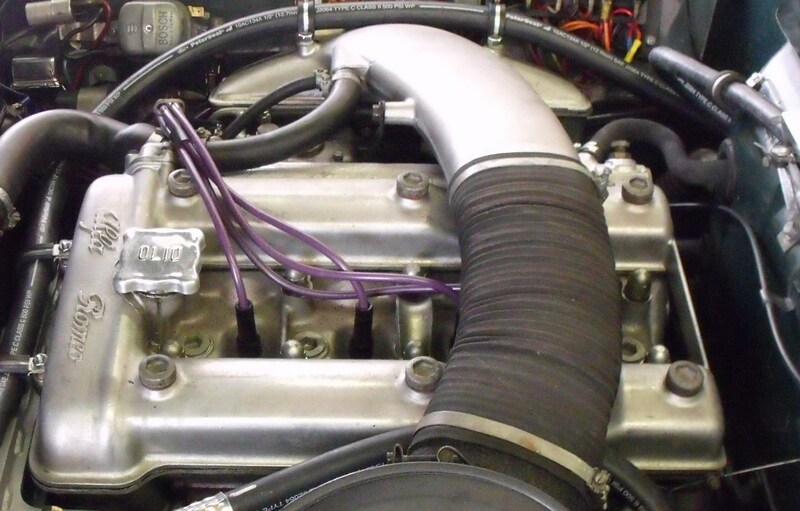 Yes, I need to remove the air filter hose to access the #4 plug, but that takes 30 seconds. Once that’s out of the way, the plugs are RIGHT THERE. So out they came. Plugs numbers one, two, and three looked almost identical. That’s not to say that they looked good. All three of them had significant carbon deposits on them. They were not wet from gas, nor oily, nor sooty with unburned fuel, which was some good news. The #4 plug. I’ve been working on cars for 40 years. I can’t believe this plug fired. Before proceeding further, I went into the house to pull my invoices on the car. When I bought the plugs, early in 2013, I had not yet settled on an Alfa supplier which I felt met my needs. The plugs were purchased from a U.S. supplier with whom I no longer conduct business. 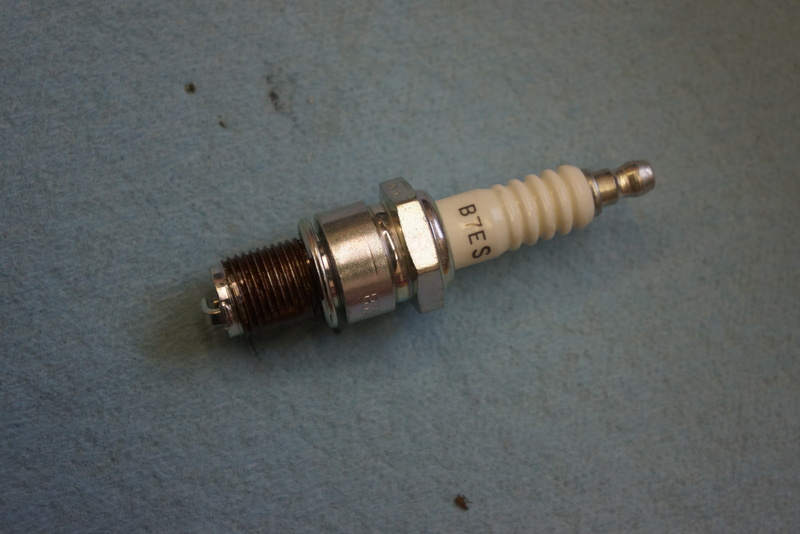 They were Bosch plugs, and from everything I’ve since researched, no one today recommends these plugs for Alfa engines. My principal supplier, Classic Alfa in the U.K. exclusively recommends NGK plugs, and that’s what went in as replacements. While I was under the hood, I removed the distributor (one 10mm hold-down bolt), and replaced the points and condenser. I lubed the distributor in three places, put on the new cap and rotor, and put it all back together. She fired right up, of course! – unlike three years ago, when I accidentally grounded the points…. Taking the car for a test drive, I was not expecting any significant power improvement. I mean, we’re starting with 100 hp, so, who’s going to feel a 5% increase? What was noticeable was the difference in throttle response. Touching the accelerator pedal gave an immediate jump in RPM. The car was such a joy to drive that I stayed out for about 30 minutes, taking it through the gears, and bringing that rev-happy Italian engine up to 6 grand on the tach. Oh, and no high-speed miss. So, lesson learned. European sports cars which get driven infrequently need to have their state of tune checked more frequently. It’s easy enough to do, so there’s no excuse. This ain’t no 2014 VW. Thankfully. All photographs copyright © 2016 Richard A. Reina. Photos may not be copied or reproduced without express written permission.